The monkey business is unbearable! On March 15, 2019, the Draft Environmental Impact Report was released for the 3,500-acre Daggett Solar Power 1 project. The report is massive and the county's Land Use Services is only allowing the minimum 45-days for the public's review and written submission of objections. The project has many negative impacts for the Silver Valley, especially Newberry Springs which will suffer higher incidents of health issues resulting from increases of PM10 silica dust, property value devaluation, visual valley blight that will hinder economic development, a destruction of the rural residential character that will lead to a further decrease in population, a dwindling in school enrollments, and a negative impact upon the surrounding environment. While Daggett Solar Power 1 has a number of conflicts with the county's Development Code and the California Public Resources Code § 21000-21004 that could stop the project, the conflicts must be properly presented in a legal form to withstand a legal review. Land Use Services has already exposed its bias by circumventing many of the project's obstacles by declaring them unsubstantial and assigning them a negative declaration. Solar Power 1 is a multi-billion dollar project that has a great deal of political and industrial clout behind it. A part of that power is Land Use Services headed by Terri Rahhal, LUS department director. Newberry Springs has been exceptionally stupid in the manner that it has handled the Solar Power 1 project. The project has been known for over a year and the community has intentionally ignored the predictable Draft EIR. In January 2018, Ted Stimpfel, a community activist, requested the Newberry CSD to immediately release Kiewit Pacific funds to hire the professional assistance necessary to protect Newberry Springs. Being ignored by the board, he then attended the next five monthly board meetings to repeat his request. Thereafter, he periodically voiced his concern to the board. Meanwhile, public news blogs were published. Rather than taking prudent action, the Newberry CSD board has made lame excuses to do nothing. In August 2018, the board did send a letter to a freebie attorney to inquire if the Kiewit Pacific funds could be used to fight solar. The letter sent to the attorney, however, was unprofessionally drafted garbage which resulted in legal advice that was garbage. Garbage in, garbage out! The resulting letter, posted on the Newberry CSD's website makes it clear that the attorney was given the misconception that the funds were given to the CSD and that the funds were public sourced. A simple and diligent investigation by the board would have revealed that the private funds were not given to the CSD but to the directors in a fiduciary trustee agreement to distribute on the behalf of the prevailing private citizens in a lawsuit that the CSD had minimum involvement. The citizens expressed that they wanted the funds to be maintained separately from the CSD's treasury which would not limit the use of the funds under LAFCO. This agreement between the citizens and the CSD board is further evidenced by the CSD itself conducting a survey where the CSD provided about a dozen suggestions for expending the funds that are beyond its LAFCO scope. With Newberry under the ax, the Newberry CSD board with the private funds readily available have repeatedly failed to use the funds to protect Newberry. Through malfeasance, the board has never bothered to take the steps with an open mind to understand the funds nor their fiduciary duties in managing the funds. Consequently, the expertise that would now greatly assist Newberry's survival (as we know it now) has been denied. The Board lacks professional business minded people. Newberry Springs is in critical need of professional assistance to properly address the hazardous advancement of utility-scale solar impacting the community. Professional leadership when recognizing an urgent need, finds remedies. The CSD Board is anything but professional. Critical days (now many months) in properly fighting the proposed solar intrusion have been lost (thanks to Springer, Deel, Paulsen, and Clark). 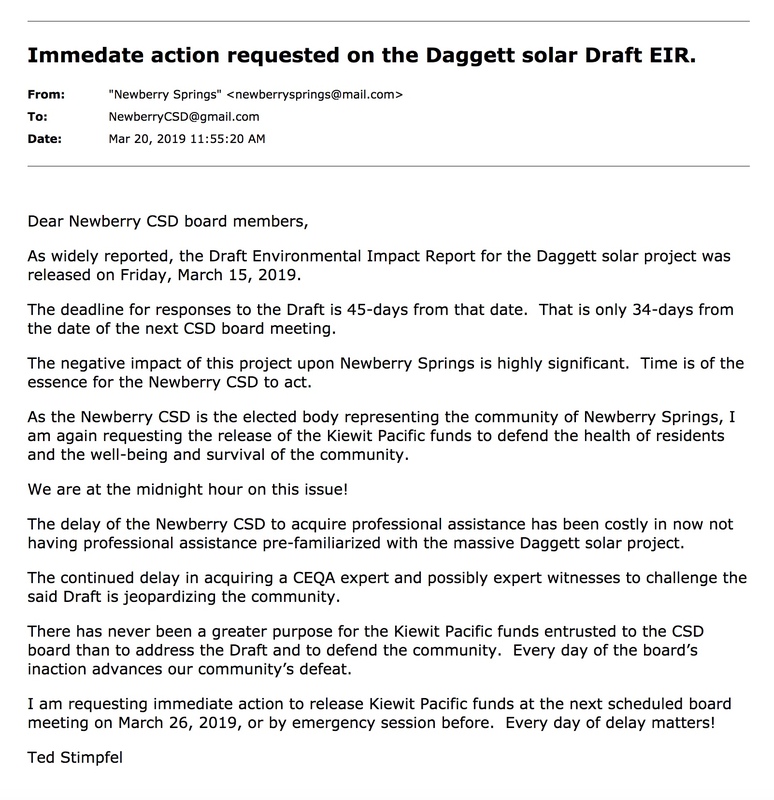 On Wednesday, March 20, 2019, Ted Stimpfel sent an e-mail to the Newberry CSD board members requesting that the release of the Kiewit Pacific funds be considered at the next monthly board meeting on Tuesday, March 26, 2019. The matter warrants an emergency session, yet, the Newberry CSD board, made up of President Robert Springer, and members Paula Deel, Vickie Paulsen, Jack Unger, and Larry Clark have failed to take prudent action in defense of the Newberry community. This news blog isn't meant as a "rant" but as an illustration that despite over a year of opportunities to get a very critical matter straight, the Newberry CSD board has repeatedly demonstrated that the board members are severely incompetent. The proposed Daggett 1,200-acre Sunpower Solar project, immediately west of Newberry Springs, has been officially canceled. The developer is reported to be attempting to sell the land, ideally to another solar developer. Although a new solar developer will be now subject to Policy 4.10, Policy 4.10 will have little impact as much of the land isn't zoned Rural Living that Policy 4.10 covers. The three other proposed solar projects between Nebo and Newberry Springs, the 3,500-acre Daggett Solar Power 1 project, the 33.9-acre Daggett Solar 33, and the 133.9-acre Daggett Solar 66 are all still pending. County Supervisors adopt Policy 4.10. Union solar installers, mostly in blue, grouped together during the county Board of Supervisors' hearing on Policy 4.10. The hearing was held on February 28, 2019, in a temporary hearing room while the principal hearing chamber is remodeled. The question of how business-oriented Supervisor Robert Lovingood would represent his constituents on Policy 4.10 was pleasantly revealed as Lovingood strongly backed the residents' supported policy. The only disappointment of the meeting was that the Supervisors did not support (as expected) the recision of grandfathering projects that filed applications since August 8, 2017. Newberry's Ted Stimpfel and two other speakers advocated for the recision. The grandfathering-in was specifically set in place by Terri Rahhal of Land Use Services at the Board's hearing on August 8, 2017. While the much-heralded Policy 4.10 is a very important element to the Development Code to protect communities from rampant utility-scale solar development, it may have limited protection for Newberry Springs. Policy 4.10 only impacts Rural Living zoned properties and communities that have community plans. Newberry Springs does have a community plan that was submitted to the County years ago but the plan was never processed by the County for approval. An interesting legal question may arise as to whether County approval is necessary to kick-in Policy 4.10, especially since the County never rejected the plan. 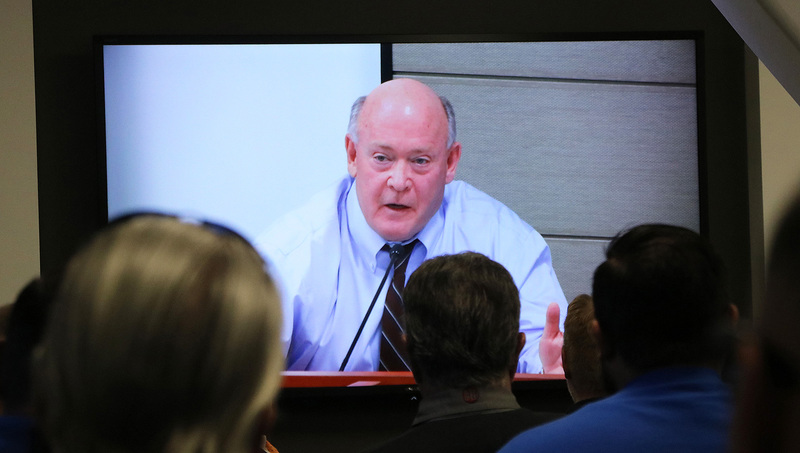 Supervisor Robert Lovingood is shown on a screen during the Supervisors' hearing on Policy 4.10 on February 28, 2019.